Yeah, I know that it’s the wrong season to be making warm, chunky, almost knee-length house socks but my fingers were itching to do some crocheting. I’ve been sewing so much these days that I feel I’ve been neglecting my yarn stash, so I figured I could make these socks now and stow them away ’til winter comes. 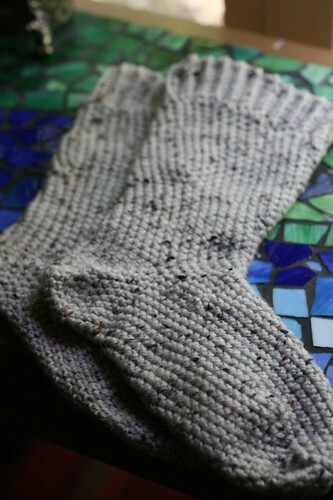 I just love the cozy look of aran fleck yarn. i’ve got the dresses, now where’s the spring weather? I’m afraid to make socks, for some reason. Everyone says they aren’t hard. Your’s are gorgeous! deirdre — thanks! actually i, myself, have been scared to knit socks, but i can attest that crocheted socks are quite easy! Maya, these are great! I think I like to crochet more then knitting, so I’m pretty tempted to make socks like these, is there a pattern for them?